When I export to Word or as an rtf file, each text file becomes a different document. Is there a way to have the entire manuscript export all together as a single document? then you have a single integrated manuscript that should export as one file. If you imported the file from Scrivener, it takes the first form automatically, because that's what Scrivener's sections are (separate files). If you create a new file via New > Project, and pick, say, the Novel template, you should get the integrated file shown second. If you've done one and worked on it and want the other, though, I think that can be laborious to do. Steve may have a better solution. If, instead, you're referring to each character or setting saving as a separate RTF or RTFD file, that's deliberate. You can merge the files on export by choosing File > Export, selecting Outline next to Export and RTF as the format, and clicking on the files you want to merge. But you won't get everything, just the summaries. I have one project with a red-tipped item and then a bunch of chapters below it. That one exports and counts words really smoothly. What type of document is that called? It doesn't seem to be a section or a text file. It is a text file. The confusion is that the red-tipped ones are also text files, but they originated in the Notebook (in an earlier version of Storyist), so they behave differently. 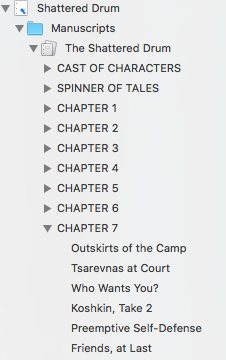 When Steve set up Storyist to import Scrivener files directly, he replicated the different structure of Scrivener files by using those former notes to represent the individual scrivenings. And that's pretty much the limits of my technical expertise. I've been using Storyist since 2007, so I have always set up my novels as in the second screenshot above. And because I'm writing a series with overlapping characters and settings, many of my files have been rolled over and repurposed since version 1. 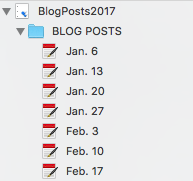 The only thing I use the red-tipped files for are my blog posts, where it's useful to have each one treated as a separate piece. As a result, I can't help much more than I have already, beyond that basic explanation. As far as Storyist is concerned, red-tipped text files are separate, and text files with an icon that looks like two pages with writing on them are single manuscripts, no matter how large.